There's trouble ahead. I'm sure of it. It's early in the season, I know, but people in Stuttgart aren't going to like what they saw and heard at Sepang. It's not just that the McLarens aren't keeping up with the Ferraris. That's not the problem. They've been there before. Daimler-Benz waited two long years before it first scored a Formula One victory with McLaren. It kept the faith and was rewarded with Mika Hakkinen's two championships. The 2000 season was as close as 'close' could be. Now the battle with Ferrari in 2001 is well and truly joined. As Couthard said, "They're doing to us what we did to them at the beginning of 1998." It helps Mercedes to have a real contest with Ferrari; it's good for the value of the Formula One world championship and the Germans know that. That's not the problem. The problem is BMW-Williams. Like Honda, BMW has come into Formula One the hard way. It doesn't farm out its engine manufacture to a specialist like Ilmor or Cosworth, just putting its brand on an engine produced under contract by experts. Instead, BMW makes its own engines, albeit in a special facility in Munich. That required staffing up for the job and building up expertise over years. BMW was expected to need quite some time to reach the current level of power and torque in Formula One. I'm certain that the view in Stuttgart was that BMW-Williams wouldn't be a serious threat until 2002 at the earliest. BMW has surprised us all. The qualifying performance in Malaysia was excellent. That Montoya did so well with so little time in the car is a clear indication that the package is strong. 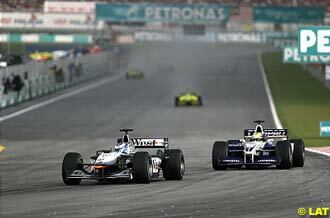 Nor was the race performance poor, with Hakkinen's McLaren unable to pass Ralf Schumacher. As well, the BMW-Williams topped the speed-trap times. This is not always an indicator of power but it's a pretty strong hint that the new V10 has a lot to offer. In fact, some of the pundits at Sepang were saying that they thought the BMW was the strongest Formula One engine on the planet. The thing is, I don't think it is. I think the problem is that the McLaren chassis isn't delivering the engine's power to the road very well. Engine power isn't of any use if it can't be delivered to the road. That being the case, we are going to see some serious internal strains in the Ilmor/McLaren relationship. I say that because neither Ilmor nor Daimler wants to be seen as second-best in the horsepower department. We're talking about proud people here. I'm sure they believe that their engine is second to none in Formula One right now. They could, from time to time, admit some superiority on the part of Ferrari. Ferrari is not a rival to Mercedes-Benz in the marketplace. It is a specialist maker of exotic sports cars and it is seen as a great rival as a racing-car team. But BMW is the most hated and feared rival that Mercedes-Benz has on this earth. And the last thing that Daimler wants to see is BMW being thought of as superior in the horsepower department. If, as I suspect, the fault lies not with the engine but with the chassis, you can see why I expect the internal tensions within the McLaren-Mercedes relationship to reach jagged peaks that will make the recent stock market fluctuations look tame. McLaren will be under mammoth pressure to get its act together in the grip department - not to catch Ferrari but to stay ahead of BMW-Williams! Won't the coming reintroduction of traction control help? Not at all. Traction control can only help a chassis make full use of the grip that's available. If mechanical traction is wanting, as I suspect is the case here, traction control can't do anything about it. Thus, the biggest problem that Ferrari will face this year is the threat from BMW-Williams - not its direct threat on the track but the impetus that the initial success of the team from Munich will give to the efforts of McLaren and Mercedes. Interesting, that. The rivalry between these two companies is the very source of the motivation that has made them both by far the world's dominant suppliers of cars for the executive and the upwardly mobile. Now their rivalry bids fair to generate intense competition on the track as well; competition that in the not-too-distant future could leave everyone else in its wake. ...And it all started at Sepang.